So, I’m in a tad of a quandary. I’ve had tetracycline stains for as long as I can remember. I’ve always been embarrassed by my smile as a result. I’ve been saving for years to do something about it. I FINALLY have what I think is enough. I went to visit my family dentist about it. We’ve known him for years and he’s a reputable dentist. He’s suggesting six porcelain crowns. I don’t know why, but have this niggling feeling this is the wrong way to go. I think it may be that I’m not crazy about the idea of having crowns. My teeth are healthy. Am I overreacting and this is the right direction to go? Your gut feeling is right. Your dentist probably has the best of intentions on helping you, but I don’t think he realizes the complicated nature of covering tetracycline stains. I don’t think he’s the best dentist to help you. There are two things he’s suggested that confirm this to me. 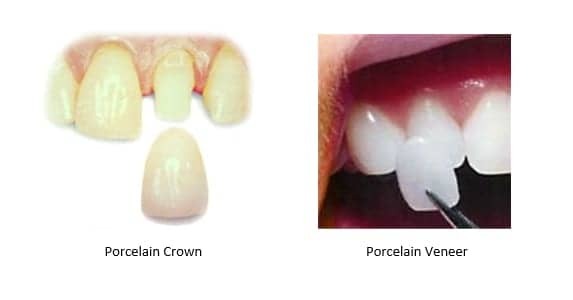 The best cosmetic fix for teeth is to have porcelain veneers done. These are thin wafers of porcelain which fit over the front of your teeth and “hug” the sides. They can completely remake your smile, changing the shape, size, and color of your teeth simultaneously. Your dentist is suggesting dental crowns. As you noted, this grinds down healthy tooth structure. You’ll be stuck with dental crowns for the remainder of your life. There’s no reason for him to suggest this if your teeth don’t already have crowns on them or are not in need of crowns. He’s only suggesting it because that is the procedure he’s comfortable with. He’s suggesting six crowns. This is a common mistake with general dentists. In dental school they’re taught to think in terms of anterior/posterior teeth. The front six teeth are considered “front” teeth, everything else are considered back teeth. Instead, cosmetic dentists are taught to think in terms of the “aesthetic zone”. Most smiles are much wider than six teeth, as you can see in the picture above. 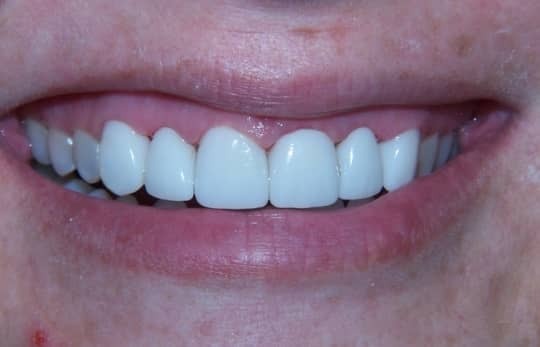 This woman had her “smile makeover” done by someone who didn’t truly understand the aesthetics of cosmetic dentistry. As a result, you can tell the six front teeth are dental crowns. It’s obvious her smile is fake. I doubt that was the look she was going for. Tetracycline stains are one of the most challenging cosmetic procedures. You need the veneers to be opaque enough to cover they grayish color, but not so opaque it doesn’t reflect natural light and look fake. It will take an expert cosmetic dentist. If I knew where you lived I’d recommend someone to you. Fortunately, there’s a site I’m going to recommend. Mynewsmile.com screened cosmetic dentists who want to be listed for both technical skills as well as artistry. Anyone listed on their site is capable of giving you a beautiful smile.